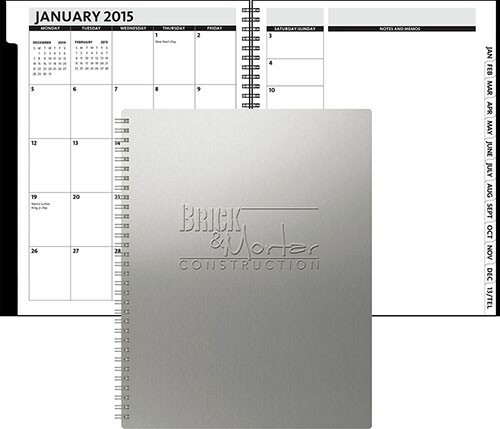 The Alloy Planner is built tough to ensure your message lasts the entire year. They are made from the highest grade heavy-gauge aluminum with smooth edges and an anodized finish that resists scratching. This version has a Silver Alloy Front Cover and a Black Chipboard Back Cover. Consider adding a Pictorial imprint for a totally custom impact! The planner is 8.5" x 11" when closed. Silver wire binding is standard. Made in the USA. Each planner is inserted into a Protective Clear Glassine Envelope at no additional cost. 1 location embossed logo within a 16 square inch area is included in the book cost. Setup fees will apply. Please have artwork reviewed prior to placing the order. Standard turnaround 10-15 business days from production ready order.